Hi everyone! I'm Jess from Curating Style, and I'm excited to be sharing with you some fun finds while Halle is away. (Thanks again for having me!) 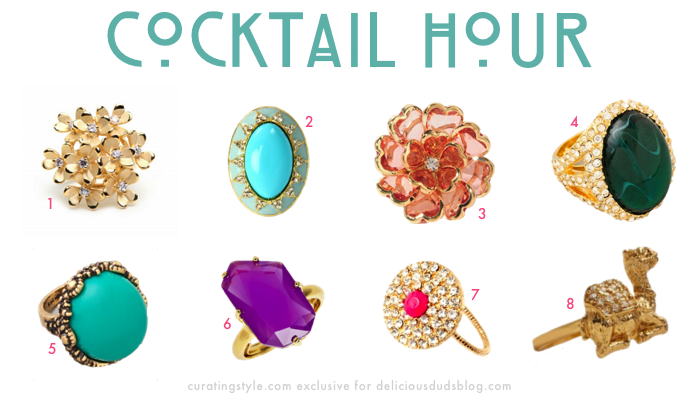 Today we're talking about cocktail rings as the perfect accessory. Pairing one with little or no other jewelry—no more than a simple gold tennis bracelet or chain necklace—is my preferred way to go. A nice cocktail ring can also brighten up simple solids, workwear, and party dresses. If you're looking to add a statement piece to your wardrobe, consider the cocktail ring. You can start small, both in size and price, and they really add an extra pop. Do you own any cocktail rings? How would you wear one? I love cocktail rings, they're such an easy way to add some excitement to an outfit without the bother of layering or combining pieces - just one and you're set! I love # 1, 2, and 8 - such great finds! me too! jess found some amazing pieces for this post - love #6! I love how these rings can add a little pop of color to any outfit! my fav is #3 and #6!